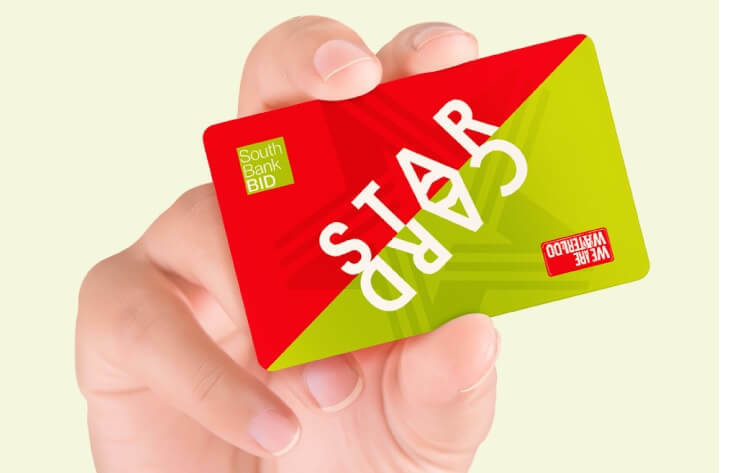 The STAR CARD has has launched to reward South Bank and Waterloo employees, and support those local businesses that keep the area thriving. Our South Bank BID and WeAreWaterloo BID have teamed up to bring significant discounts on food and drink, shopping, health and wellbeing and attractions for every employee, student and local resident. We know that the members of the two BIDs are keen to recognise their valued employees and the STAR CARD helps them to do that. “The loyalty card will help with retaining and attracting staff who are vital to maintaining our success by providing them with additional, significant benefits,” said Claudio Giambrone, Head of Marketing for both South Bank Employers’ Group and the South Bank BID. Employees working in the areas covered by South Bank BID and WeAreWaterloo will benefit – stretching from Lambeth Palace and London South Bank University in the south to the Sea Containers building in the east. You can request and register a STAR CARD, and find out about the latest available offers, by clicking here to visit the website.